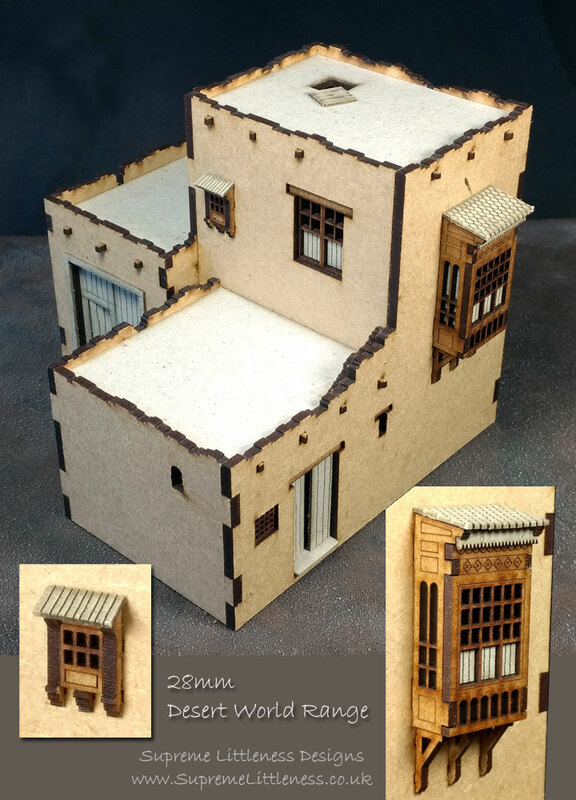 First of a new range of 28mm desert buildings available now from Supreme Littleness Designs. I don't know how appropriate the "Muslim balcony" is on adobe buildings, however, it would work well on Greek buildings for the 1800s. The window pieces seem to be sold separately, so you could buy them for other purposes. "Arabic/Mediterranean latticed windows" (or something along those lines) also works. That's really extremely well done, by the way. I love it. I really like that. I'll add this company to my list of lasercut scenery firms to buy from. I have also bookmarked this company. Thanks for bringing them to our attention. I too would like to be able to purchase a couple of these windows to spice up some of my middle eastern buildings. The projecting oriel window/balcony is now on sale as a separate kit.